Since the release of their exuberant hit "Dreaming", indie-pop band Smallpools have played major festivals like Firefly, toured the U.S. with bands like Grouplove and Twenty-One Pilots, and released their full-length album debut, Lovetap!. Now Smallpools is looking forward to a tour with Misterwives, and the release of their new EP, The Science of Letting Go. With a title like that, you know there are some stories behind Smallpools' upcoming release. I had an opportunity to chat with lead singer Sean Scanlon about the inspiration behind The Science of Letting Go, as well as accidentally co-writing for The Chainsmokers, and the how the band acquired a series of unusual ‘pets'. 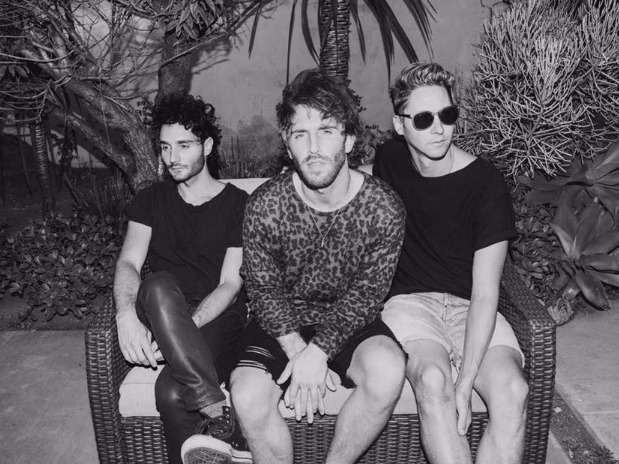 Check out the full interview and catch Smallpools on their tour which kicks off September 21st. CAROLINE BOJARSKI: Your new EP, The Science of Letting Go is out August 4th. Is there anything in particular that inspired the title or the theme of the album? SEAN SCANLON: I think it just so happened that the songs that we landed on for this EP all kind of had a piece of that (letting go) theme to them in some way or another. I think that letting go is an interesting thing, and that it's very hard for humans to do. They are creatures of habit. And it was an interesting title for me. There's a song that has to do with needing to let go of something that's obviously bad for you, but you keep trying to make it work. There are songs about letting go of inhibitions in order to move forward in your career. It just kind of landed that way, but I like the title and it was a line in one of the songs as well, so I think it came together nicely. CB: You write all of the band's lyrics, right? SS: Mostly. Sometimes there will be times when we're all in a room kinda throwing ideas together with a producer or something, and there's a few lines that aren't done or aren't working yet, but usually the theme is everyone kind of jams out the ideas and then I go away and write the words. CB: I'm definitely someone who is drawn into songs by their lyrics. Do you have a favorite line or song that you think came out really well on the new EP? SS: I think some of the concepts and themes of this are really fun and cool and relatable. I like "Passenger Side". It's just a very simple concept, of being in the passenger side, steering for your friend or girlfriend or something, but the imagery that it set for me was really cool. And then "DJs & Porsches" I thought was really fun. I was feeling super numb and kind of coasting and not really inspired for a little bit, and I thought that I needed to get myself into a situation where I had to feel hurt in order to just feel in general and be inspired again and moody so I can write some stuff. So that's kind of about doing that. CB: Did it work? Were you inspired after that? SS: Yeah! It was cool it was this nice, new situation. I know it's gonna fall apart and… it did, and I got a cool song out of it. CB: I read that you changed your writing style for this new album to reflect more real life situations. Did you feel differently about the finished product than you did with Lovetap! Or your other previous music? SS: Slightly different, but I don't really know how to explain why. It just happened to be that -- we wrote a lot of songs over the (last) year and a half -- but our favorites just seemed to be the ones where it was concept first as opposed to some of the older stuff where we would just hammer out melodies and melodies, and I would go fill in the blanks for us later. Maybe the melodies are a little more simple in this than in the old stuff, but I can't really put my finger on it. There's definitely a difference but I don't really know what it is. I guess that's for fans to decide. If they hate it… then I guess it's different for the worse. CB: I heard that you guys tour with statues of greyhounds and put them on the stage when you play. Is that actually a tradition that the band has? SS: It has been, but I don't know if it will continue into the next chapter. One night in LA, a long time ago, we did a hip hop bingo night. It's basically bingo, but there's hosts dressed in hip hop gear and singing 90s rap. And I won a prize that night. It was a porcelain greyhound, and we took it out with us for the rest of the night because we didn't have time to go home. When you walk around the bars with a greyhound it's like you have a newborn child. Everyone wants to name it and pet it and stuff. CB: Does it have a name that stuck? SS: I think the first one was just Bingo in light of the night, but there's been a lot of iterations ‘cause our producer smashed that one on the floor of a hotel one night. He got us a new one on Ebay shortly after. Basically every time one would break we would look for another. There was a woman on eBay who had a stash of them, and then sometimes you'll find them at Ross. CB: Like the thrift store, Ross Dress for Less? SS: Yeah. So I think we burned through the stock of those in the entire US. Eventually someone found us like a huge steel one so we went with that for the last tour, but he might have worn out his welcome at this point. We need a new mascot. CB: Your song, " Dreaming", got a lot of remixes including one by The Chainsmokers. Are you thinking of remixing any of the songs from your new EP? SS: We have some friends that do super cool remixes doing a few of the EP songs, so we're definitely gonna go down that route. The Chainsmokers thing from back in the day was funny because we really didn't know much about the remix world at all, but at the time people were telling us "You need remixes". So we really just looked at the number one spot on Hype Machine which was a place where a lot of remixes were rated. The top remix at the time was a Chainsmokers remix of "Say Lou Lou", and we'd never heard of The Chainsmokers before, but we just wrote them a cold email and they were super down to remix it ("Dreaming"). This was obviously way before they became like the biggest thing in the world, but it's very random and coincidental how we came into contact with them. Which is cool. It seems to be a lot of the way things succeed in music. Just patience and luck. A little bit of skill obviously. CB: You also co-wrote a song with The Chainsmokers. SS: Yeah, that's how we made the first connection. Just that cold email on the remix back in the day, so we ended up getting something on their latest album that would have never happened if we hadn't made that connection years before, so it's kind of crazy. CB: Your music has kind of a summer-y feel to it. If your new EP was an ice cream flavor, what flavor would it be that you think would describe it well? SS: I could tell you my favorite flavor growing up was mint chocolate chip with hot fudge. I think that would actually make sense. It's refreshing with a little bit of a kick to it. CB: Smallpools played live for the first time in NYC at Brooklyn Bowl. Do you have a memory from playing your first show that really stands out? SS: I remember we had a lot of friends there, and I was definitely nervous , but I thought it was sounding pretty good. It was exciting to me that this new thing was not a complete disaster in front of a lot of people I cared about.